So much so, that a couple of the here shown designs are now actually being constructed! I am even receiving gifts as a thankyou for the help. As I pretend to make semi-professional plans, I would like to hear your thoughts and critisims too! In case you would like to ask me for design-ideas, please read the text at the bottom of this page! To see and read about each of the published plans here, just click on the picture of the layout. 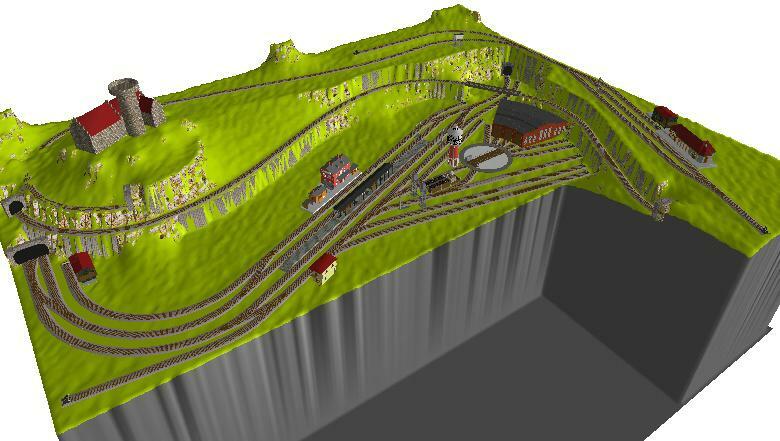 Where nothing else is mentioned, scale is H0, and tracks are from Märklin. Lots of space, but limited track-material. Advanced entry-level layout. Swiss alps. Expert level. Wide radius. Terminal station. Beginner level. Fun play-layout, with serious ambitions. Big expert layout. Lots of everything. Entry level layout. No fuss. Experienced level. Slim switches. High standards. Experienced level. Compact layout. Terminal station with circular paradestrecke. PHOTOS from the actual construction! Beginner level. Made for british DC (Hornby) modeller. Lots of space, but limited track-material and complexity of construction. Lots of fun in this one, though! Many and complex running possibilities. Relatively easy construction. Compact layout, with complex construction. Interresting "dogbone" mainline with simple branchline. Lots of shaddow-stations. Quite a famous LCTM-layout "redone" for advanced computer control. Compact layout, with rather complex construction. Another LCTM-layout. Lots of space (restricted height). Large yet simple layout with a medium construction-level. How to design a good track plan. Avoid ovals, or trains going round in the same circle(s). Use the dog-bone principle instead (as shown in the design of my actual layout). If you use 2 rail DC beware of short circuits when making reverse loops! Do this! Build a shadow-station as big as you possible can! As a rule of thumb you can say that the amount of hidden tracks should be more or less equal to the amount of visible tracks on your layout. It is far better to build a small station in the visible part, with a huge shadow station, than to build a big grand central station without any posibility of storing trains in an out-of-sight shadow station..
What I like about a layout is to sit back and se the different trains pass by, and so an automated shadow-station provides nice variation all the time. Dont use the pathetic standard curves in any visible part of your layout. (at least not for the main line). 360mm radius curves are way to sharp to look real, especially if you use material with 4 axels. Dont lay track absolutly parallel with the border of the layout. Make a slight angle to it, or a soft curve. 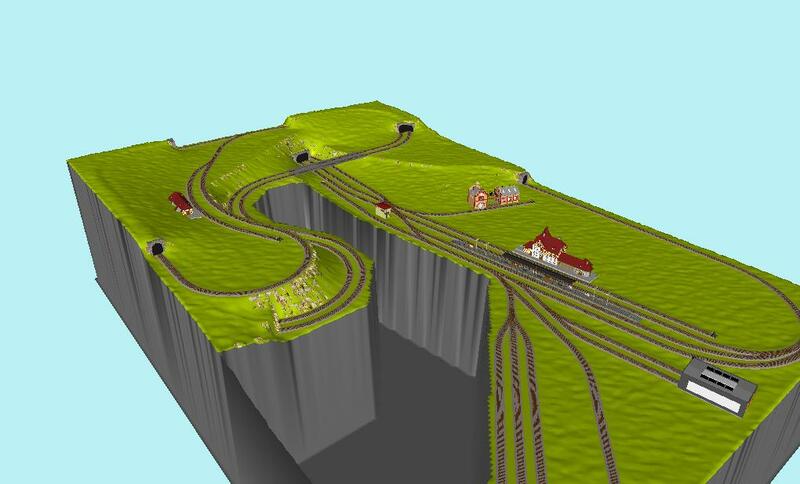 Try to enter and exit tunnels on almost straight tracks, so that nobody can guess where the train is going when it enters a tunnel. Try to fit in a section where the trains can get a long un-interrupted run. -With no station or signals to stop them. This can normally always be achieved, regardless of what little space you have available, by constructing it at another level than your main station. A parallel stretch of tracks is only 15 cm wide. If you have this, now try to time the signals so that two trains almost always cross each other on this "Paradestrecke". A lot has already been said about helix'es in the internet, so I suggest you enter "HELIX" in Google -or any other preferred internet search-engine. I only want to stress that in a parallel track helix one should make sure the trains CLIMB the helix on the OUTSIDE track, as this will have a lower inclination than the inner track. 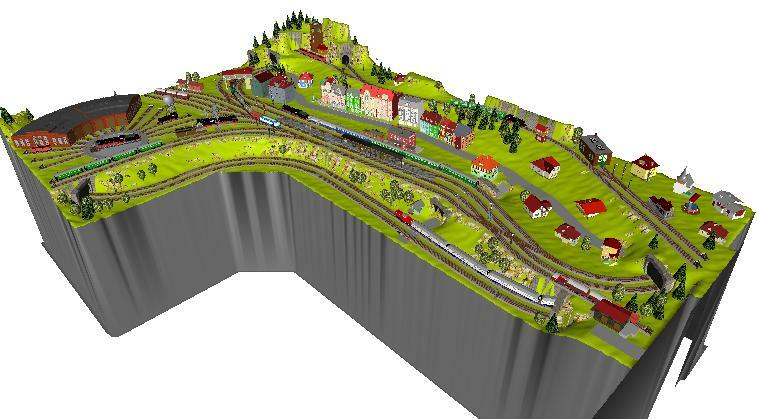 You really DONT want to saturate your layout with tracks and tracks and even more tracks. It's simply impossible to fit all of your creative ideas into one design, -and I dont mind just HOW much space you say that you have available. Go think about it a good long time, and then start SIMPLIFYING that super optimated design that you have worked out over several weeks using the latest in computer aided design technology. The same also goes for separate parts of the layout; Its much better to decorate a part of the layout with a single well-selected house, than cramming 5-6 houses into the same area just beacuase they all fit in there physically. Now. Repeat after me: "LESS IS MORE". Thank you. First off; I'm flattered, of course. Thanks for beleiving in me. Second: I'm not a professional designer, I do this just for the fun of it. BUT making a good design that is actually going to be USEFUL to somebody takes a lot of effort! Therefore I hope that you understand that I am not able to take on all and every request coming my way. Note: If you are a beginner, or the following things sounds too technical, dont worry, just take into account whatever you can! I will be asking you a lot of questions anyway, and I'll make a qualified guess for any unanswered questions. Note2: Exceptions: I am sorry, but I cannot currently help planning using Hornby tracks. I miss them in my track-library, and I dont have the geometric information to make my own definition-file. Measures of available space. All limitations and oddities of the room/area at your disposal. Also take into account where any tables, chairs, vitrines etc. might be installed. A technical drawing of the room is just perfect. Type of track to be used. Minimum radius to be used in curves. Level of complicity of the construction; Should it be based on a simple plate, or are you able to construct an open framework with ramps. Epoc and country if any specific. Available track and limits on what additional material might be acquiered. Weighed themes such as BW, swithcing yards, industries. Prefered style (if any), such as terminal stations, secondary lines. 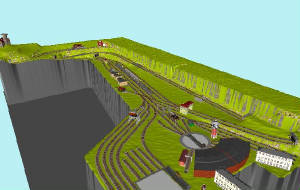 If you want to OPERATE the layout, or simply prefer that everything runs as automatic as possible. Preferred landscape; mountains, hills, flatlands. Note: (November 2003) I get a lot of requests -and I am very happy with that, thanks! -But please understand that requests that does not include a MINIMUM of information will not be regarded as serious requests! Note: (November 2005) Thanks to everybody who have contacted me for designs, and apologies to those who have contacted me in vain, and for those who have had to wait ages for me finishing their plans. My daytime job, the work involved moving to a brand-new house and the realization (finally) of my own layout, leaves absolutly NO time left for the Design Service. Reading through the layouts shown here, one could be lead to beleive I only do designs for spanish people. Well, nothing is further from the truth! I am currently designing for british, danish and american people, and more requests are coming every week.